Biologists are opening windows of understanding on all aspects of the living world. From cancer research to animal behavior, they are living the adventures of exploration and discovery. Travel, conduct research, gain internship experience, work with professors, take classes you care about, and get prepared for a career. That's what Heidelberg can offer you. In our biology program, you get to call the shots for your own education. With a faculty that loves teaching, they not only encourage you to explore and expand, but they'll also help you do it. Heidelberg’s cadaver lab sets it apart from other undergraduate programs. As an undergraduate, you’ll have the opportunity to prosect the cadavers and practice frontal dissection, followed by specialty dissection such as knees, spinal cord, eyeballs, larynxes, and brains. The lab offers additional study materials including preserved sheep, cat and cow organs, human brains, articulated and disarticulated cat skeletons. From healthcare to research to education to field work - there are a lot of career options for biology majors. Some of our students head to grad school and others find jobs right away. You can consider careers such like botanist, dentist, geneticist, physician assistant, parks and recreation educator, pharmaceutical researcher, and veterinarian. Before she even graduated, Vicky Johnson’s dream came true. She was accepted to Ohio State University’s College of Veterinary Medicine. The school receives over 6,500 applications a year, interviews just over 400, and accepts around 160. Meaning only 2% of students who apply are accepted. Vicky was one of them. Everyone who applies to vet school is good at science – they want to see what else you do. Heidelberg could get me that. There’s not a single faculty member that I didn’t learn something from. I’ll always praise my experience here at Heidelberg. Below is a sampling of courses offered in biology. For more information, see the major requirements. 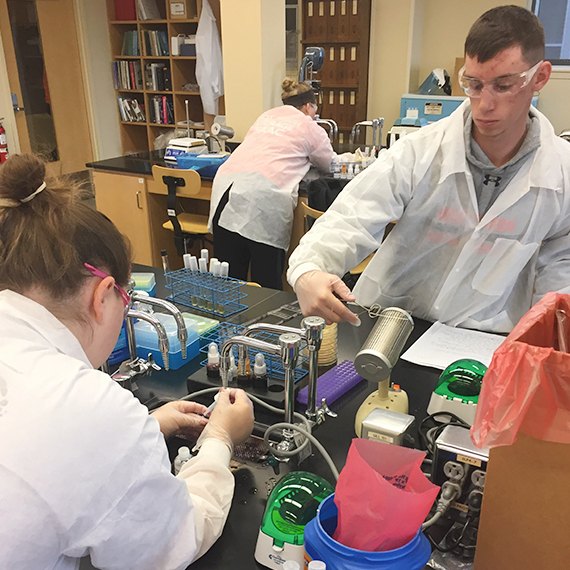 Implemented by Dr. Justin Pruneski, biology students have taken part in the innovative Course-Based Undergraduate Research Experience (CURE) in Microbiology.